With the arrival of Dell 12th generation servers (12G) and Microsoft Windows Server 2012, your organization can now significantly simplify Windows Server deployment. Window Server 2012 delivers a number of new enhancements and features over your current Windows Server 2003 or Windows Server 2008 infrastructure. With Windows Server 2012, your organization can benefit from improved virtualization, identity and access control management, graphical interface, storage and networking, and Web and application hosting. Dell 12G servers provide a powerful platform for Windows Server 2012 and its advanced features, giving your organization better performance, reliability and management, all of which improve return on investment (ROI) and your bottom line. 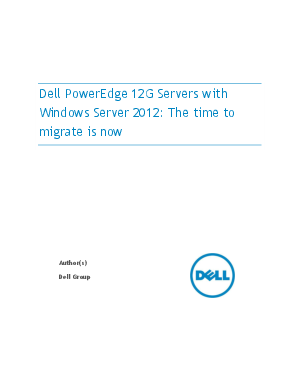 For more information on powering Dell servers with Windows Server 2012, see www.dell.com/ws2012.